Engineering graduate or Drafting Technology graduate and also undergraduate, major in drafting courses can be considered and TESDA Technical Drafting certified can be considered; With or without experience (newly graduate are welcome to apply); Experience in Steel frame housing and metal fabrication is an advantage; Knows how to read different type of measuring instrument; Able to communicate properly with top management and supplier. Licensed Customs Broker with PRC License in good standing; Customs Administration graduate; Basic knowledge of Tariff and Customs laws, rules and regulations; With good communication and comprehensive skills (both written and oral); Computer literate; A team player and can relate well with people; Fast learner and can easily follow instructions; Manila based. Customs Administration graduate; Basic knowledge of Tariff and Customs laws, rules and regulations; With good communication and comprehensive skills (both written and oral); Computer literate; A team player and can relate well with people; Fast learner and can easily follow instructions. Male / Female; Must be a High school graduate with TESDA Certificate is an advantage; With experience in troubleshooting of automotive and electrical system; Knows how to drive and with Driver’s License; Must be keen to details. Male / Female; Must be a High school graduate; Knowledgeable in basic carpentry works; Must be keen to details. 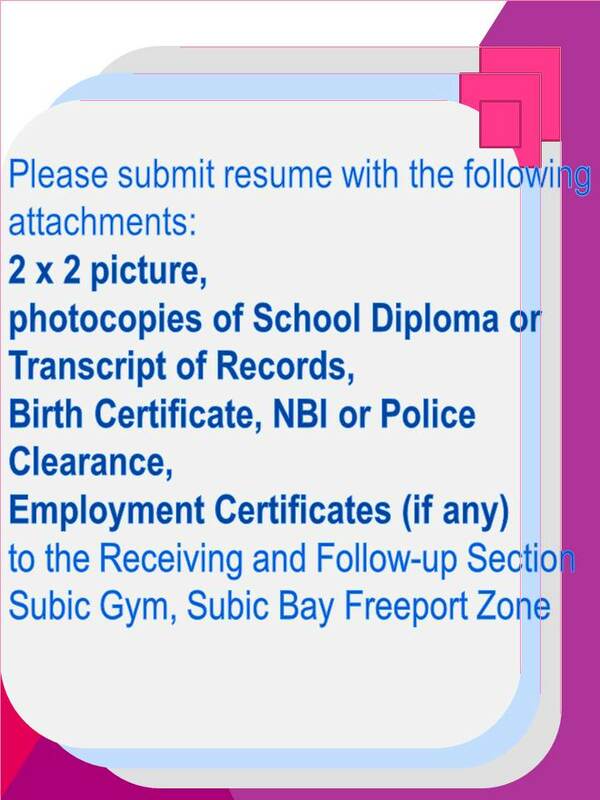 Male / Female; Must be a High school graduate with TESDA certificate is an advantage; Can design, fabricate, joins and/or repairs equipment fixtures and various type of metal and objects. Male; Must be a High school graduate with TESDA certificate is an advantage; Having an experience in body paint is an advantage; Knows how to use basic automotive tools and equipment; Must be keen to details; Must be a team player. Bachelor’s Degree in Mechanical or electrical Engineering preferred; 5+ years’ plant operations experience; Familiarity with regulatory requirements for operating plants; Able to lead root cause analysis investigations; Proficient with MS Office; Able to explain training material to our operating staff; Aptitude for equipment operation and troubleshooting; Excellent communication skills; A plant manager must have strong interpersonal communication skills; Organized and possess good leadership skills; Experience in manufacturing and production is preferred, and management certification can be earned voluntarily. Male / Female; At least College graduate of any course; With at least two(2) years work experience as a Human Resource Staff; Must be able to communicate clearly, both written and orally, as to communicate with employees, members of the HR management team, and in group presentation and meetings; Must be dependable, able to follow instructions, responds to management direction, and must be able to improve performance through management feedback; Must possess strong interpersonal skills; Must be organized, accurate, thorough, and able to monitor work for quality; Can work under pressure. Male / Female; At least High school graduate; Smart and honest; hardworking, with pleasing personality; With good moral character; Willing to undergo training; Fast learner. Male; At least High school graduate; Can drive motorcycle and 6 wheeler truck; Must be honest and hardworking. Male; Finished at least any Vocational course; Can drive motorcycle; smart, honest and hardworking; With or without experience; Willing to be trained. Good communication skills both oral and written; Good swimming skills. Male / Female; Candidate must possess at least a Bachelor’s / College Degree in Civil Engineering; With license (priority but not required); Must have skills and knowledge in 2D,3D CAD; Fresh graduates are encouraged to apply and willing to be trained; With or without experience. Male / Female; Graduate of any 2 years course, degree holder is an advantage; With at least two(2) years solid experience as Cashier in any leading fast food chain in the Philippines; Knowledgeable of POS (Point of Sales) machine; With happy and full of zest personality; Analytical, attention to details, dynamic, creative, smart and can relate effectively with other people; Proficient on oral and written English; Willing to work overtime if needed. Male; Preferably with cooking experience / orientation or undergone culinary training / schooling; Willing to work opening or closing shift (Mall time schedule); With pleasing, flexible personality; Pro-active, Dynamic, Creative, Smart and can relate effectively with other customers; Proficient in oral and written communication; Willing to work overtime if needed. Female; BSC graduate major in Accounting; With at least five(5) years experience as Accountant in a Hotel or Service industry; thorough knowledge of basic accounting procedures; In-depth understanding of Generally Accepted Accounting Principles; Awareness of business trends, Familiarity with financial accounting statements; Experience with general ledger functions and the month-end/year-end close process; develop and document business processes and accounting policies to maintain and strengthen internal controls; Mature thinking, analytical, honest and can work under minimal supervision with effective management skills. Male; Minimum work experience of 2 years as IT Assistant; Able to repair and maintenance of computer equipment like routers, servers, switches workstations and other computer related machinery; Can provide simple programming and configuration on computers; Pro-active, Dynamic, Creative, Smart and can relate effectively with other customers; Proficient in oral and written communication; Willing to work overtime if needed. Male / Female; With pleasing and flexible personality; Minimum of 3 years experience as Operation Supervisor in a service industry firm; Ability to manage operation, strong leadership skills; Decisive, critical thinker, pro-active, smart and can relate effectively with customers; Willing to work opening or closing shift (Mall time schedule) and render overtime if needed; Proficient in oral and written communication. Male / Female; With pleasing and flexible personality; Able to keep up in a fast-paced work environment; Knowledge of food service regulations; willing to work a flexible schedule, including nights and weekends and render overtime; Excellent written and verbal skills; Pro-active, dynamic, creative, smart and can relate effectively with customers. Male / Female; Graduate of Business Management or related course; At least 1 year experience as Marketing Assistant; Has responsible for the implementation of the company’s marketing strategy; In-charge of press releases, update the website and social media pages, plan events and provide administrative support; Willing to work flexible time, pleasing personality; Pro-active, dynamic, creative, smart and can relate effectively with customers; Proficient in oral and written communication; Willing to work overtime if needed. Male; Knowledgeable to order supplies, materials and equipment based on our company’s needs; Has responsible for researching new vendors, tracking deliveries and updating order records; Must be able to make cost-effective purchases and ensure to maintain a fully stocked inventory; Keen on market research to identify pricing trends; Must be able to evaluate offers from vendors and negotiate better prices; Proficient in oral and written communication; Knows how to drive and willing to work overtime if needed. Male; BS Mechanical Engineering graduate (License is an advantage); At least 3 years experience as Maintenance Supervisor or related positions; Computer literate, SAP proficiency is an advantage; Knowledge in supervision and personnel administration; Knowledgeable in ISO 9001, 14001 and 18001 management system; IQA Certified is an advantage; With good moral character; With good communication skills; With experience in Total Productivity Management; Have knowledge in statistical technique.